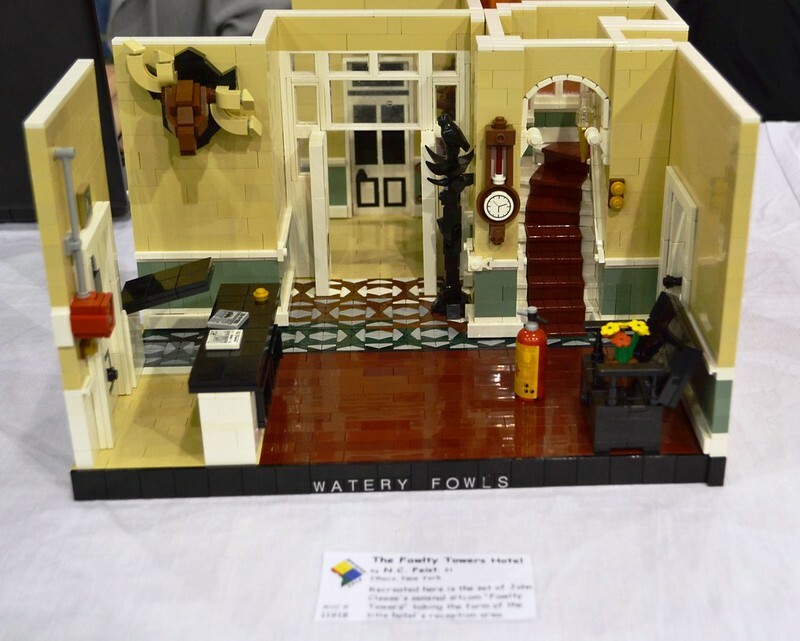 Here are some photos of my newest model I displayed at BrickFair VA this past weekend, a diorama depicting the set of the classic BBC Two sitcom Fawlty Towers. The hall tree with dual umbrella stands in the vestibule at the back of this photo can be seen in better detail here. Here's another shot from the con showing the reception desk, the fire bell, and the moose head with a broken antler. Here's a work-in-progress picture showing an alternate corbel design in light grey and some of the winder stairs. Here's what the whole diorama looked like from the front sitting on the table, which provides another view of the staircase. 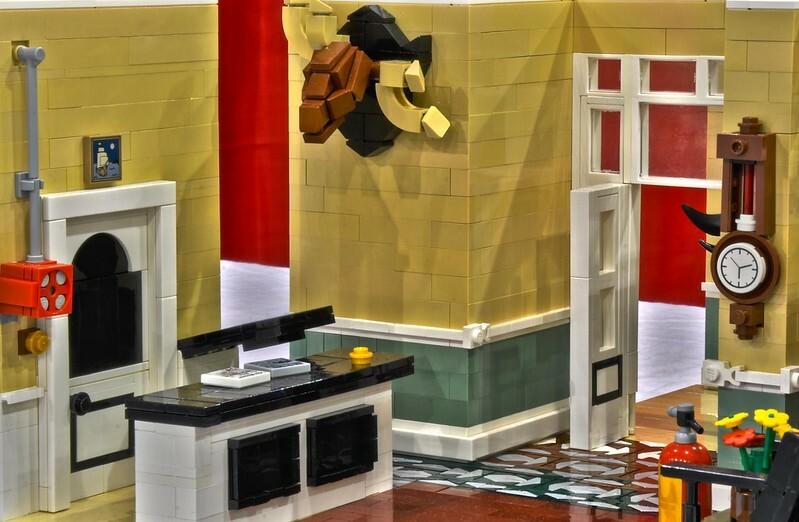 I plan to modify this and post another set of photos once I get some parts I don't yet own and will maybe even build the upstairs or exterior. All of those details are really nice and beautiful. Looks great! I've only caught an episode of the show once or twice and I still find it instantly recognizable! Congrats! I really appreciate the extra colors you've brought in as props while still having a color scheme. EDIT: Favourite detail? "Watery Fowls." Hahaha! I've seen so many episodes of Fawlty Towers that I can't count them. There was only twelve of them! But back to the MOC. I saw the Thread title and was prepared to be impressed, but these interiors are truly spot on! You've put so much detail in them. Thanks! I tried to pack in as many nuances as I could glean from the somewhat obscured views provided by my reference material. Thank you. 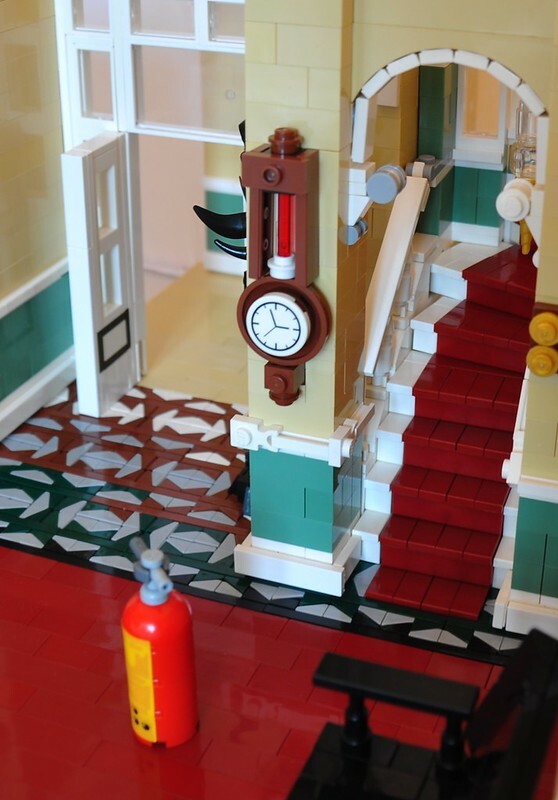 The highlights of red and yellow from the "props" (ie, the flowers, fire extinguisher, and fire bell unit) are mostly original to the show. I was pleased with the variety of color they provided, but as rushed final additions to the model I'm not entirely satisfied with the parts choices (the flower pot in particular). Maybe I'll change them up for future photos. I started out with uploading a shot of the wall tree beside the front door because it was furthest from what one sees in the show (and hence the least recognisable) and worked up from there. Since you did recognise it from images of the completed model, I'd say you're totally within reasonable bounds of acuity! Thanks, I changed the anagram for each day I exhibited this, so I'm hoping to see some photos uploaded by others where in the letter tiles read fatty owls or farty towels. Wow, what a fantastic setup! I've never seen the show, but this is gorgeous interior work if I've ever seen some. 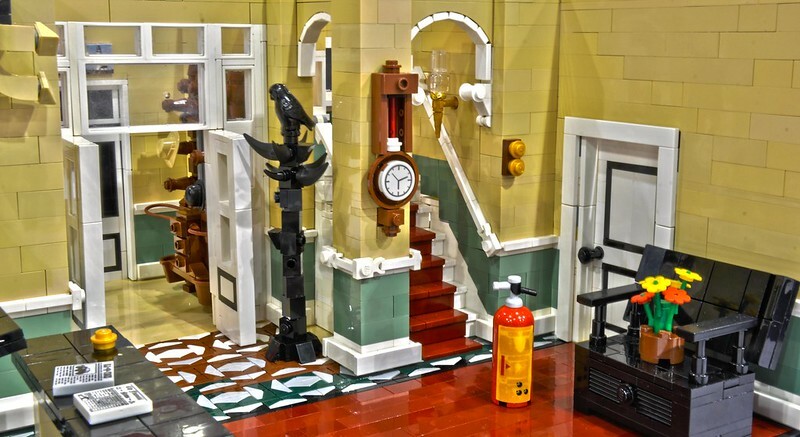 I have a soft spot for Miniland scale creations (that might just be because I haven't the parts or the room for that scale) and this is no different. The cheese slope pattern work in the floor looks amazing. The color palette as a whole is tasty, and those stairs! My favorite bit has got to be that ornate hat rack, though. It really gives off the feeling of antique furniture. Thank you! I look the liberty to design the wall tree for hanging one's hat in the most ornate Victorian style possible because the series only shows it from the side. Judging from what one can see however, it's probably a simpler design like this one, but I referenced several others for the details I included in my composite. I'm glad to be able to share it with people here who haven't seen it on flickr! I really appreciate the compliments too. Thanks, I'm pleased to have informed opinions on this! That's crazy! I had to look it up, I couldn't believe you were right about that. I must have seen them all several times then :) Still - a wonderful MOC! Awesome , I loved that show. AWESOME work 'oo7'.......at least you didn't say anything about the war ! This is amazing! I grew up with Fawlty Towers on VHS. So many little details that would make any fans of the show giddy. Watery Fowls, the moose, the fire extinguisher. It's obvious a lot of care was put into this MOC and it surely pays off. Great work! Just brilliant! 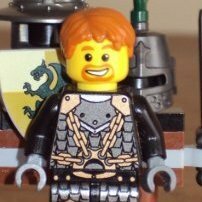 Really, this is one of my favourite MOCs I've seen in a while! It's really quite recognizable. I may just have to show this to my aunt, since she's the one who introduced the show to me. Love it! Very high quality work there! John Cleese himself would be impressed! '.......at least you didn't say anything about the war ! Beautiful!!! This is one of my favorite shows ever and you did such a great job! Ha, thank you. Eurotrash stole my line, so I'll have to leave this video instead. Thanks so much! I'm glad you could appreciate the nods I incorporated. Wow, that's very flattering, thanks. Thanks, he might be. It's too bad Cleese is only an honorary professor at my school, but he did visit my residence hall once, and I think he got away with it. Really great, love the moose head. This looks great! You made me want to re-watch the episodes after over ten years... I hope youll do the kitchen! Im big fan of Faulty Towers. U made my day by this moc, its perfect in any way. I hope ill see upper floor to. Excellent tribute to one of the greatest sitcoms ever! I really love the tiled floor. Thanks, Tedbeard! You're a face I recognize - you must not have changed your avatar since the days of the EB Pirate Ranking System! Thank you, Gary. I'm happy to share this here with some Europeans after exhibiting it for mostly Americans at Brickfair! I'm glad you fancy this one too, and when I likely have it back with improvements next year, I can show you the run of it if you like. Do it! I re-watched some episodes for reference and found I enjoyed myself more than I would have expected. If I do the dining room, I'll definitely do the kitchen too, but I think the second floor with the stairs that go up more than necessary just to come down again would be most unique. Thanks for your compliment! Glad you like it, and you have some great models on flickr yourself. I've added you too. I had hoped it might be a worthy hommage; thank you. Your avatar seems to honor a television series as well, Babylon 5? Thanks! Of course it's one of my very favourites along with Black Books, Black Adder, Some Mothers Do 'Ave Em, and although it's not a sitcom, Charlie Brooker's Screenwipe. Much appreciated, and I just saw your nice Gettysburg scene on flickr having admitted it to the Historical LEGO group (I've been a bit behind on the queue lately! ).